Life certainly is not dull being an Arsenal supporter at the moment. The transfer window is shut; Fabianski is out for the season; a great comeback against Everton and questions about Cesc Fabregas and his leadership. Well, let’s go through them one by one! Cesc Fabregas, our skipper has been in the headlines for stuff that may or may not have happened during half time. I like most people do not know what happened and instead of assuming things, will look at the facts. Cesc Fabregas has not been charged and the Referee’s report said nothing about anything that may or may not have happened at half time. I woke up Wednesday morning in a bit of a rage. I had been to the game so already had a lack of sleep but then woke up to the voice of Alan Brazil on that radio station! It was around 6.05am and he was saying how Mr Wenger and Mr Moyes accounts of what happened was the complete opposite and one had to be lying. I thought to myself, at least he is being fair and told listeners what both managers said and isn’t judging or giving his opinion about what happened…..till about 3 minutes later that is. He then slated Cesc Fabregas about the incident then even Slated Mr Wenger about what he said about Chelsea. So one minute he is saying ‘one of the managers is lying’, then next minute it is obvious who he thinks it is. I know supporters can be biased but I would have thought a presenter on a radio station would at least look at both points of view. Brazil later went on to talk about Mr Wenger’s comments about Chelsea’s spending saying if a owner wants to give a club a present (money for a transfer) then what is wrong with that. That is all fine however; Mr Wenger’s point was totally different. He was saying that Chelsea voted for the fair play financial rule but then announce loses of 70m and then spend another 70m on players. He is not questioning Chelsea spending money, but is questioning what the logic of voting for the fair play rule was. Sometimes I do feel no one understands what Mr Wenger is actually saying and jumps on anything he says. A bit like the tackling issue, Mr Wenger was talking about the art of tackling and the technique and the response he got was ‘Arsenal doesn’t like it when people tackle them hard’. Then the argument is that Arsenal are one of the teams with the most red cards this season, even though, Mr Wenger was talking about potential leg breakers and not just normal fouls. Back to Cesc Fabregas and many people went the way of questioning his leadership skills and if he should be the Arsenal captain. 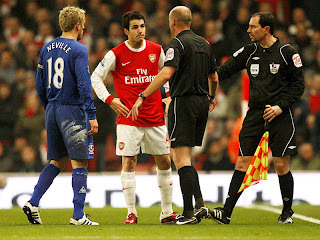 At the start of the season I remember how the FA wanted only the captain to speak to the referee during a game and Cesc Fabregas is our captain and he has questioned decisions over recent weeks, how can anyone not questioning the Saha goal. What happened in the tunnel is not clear and what Cesc said (if anything) is not clear however, footballers swear all the time. I remember that time at Highbury, I was sitting in the west stand and was close enough to hear Wayne Rooney totally let loose at Graham Poll and the language used was not the best! (Keep it at that). I am not trying to single out Wayne Rooney because there are many others but that is an example where I was close enough to actually hear what he said and was there in person. Football certainly is a passionate sport and the pressures involved in the modern game is such that sometimes it can boil over and players may use words they will not be proud off the next day (same can be said for fans, including myself). Cesc for me has developed into a good captain. Everyone does question the leadership issue at Arsenal and Mr Wenger does believe in shared responsibility however, Cesc does more then that. He leads by example; you can see by his performances recently how he can control a game and dictate the pace of a game. He defends his players on the pitch and backs and supports them up well. Jack Wilshire tweeted that Cesc is a great captain and a role model to other players and I do not think he is the alone in thinking that from a player’s point of view. 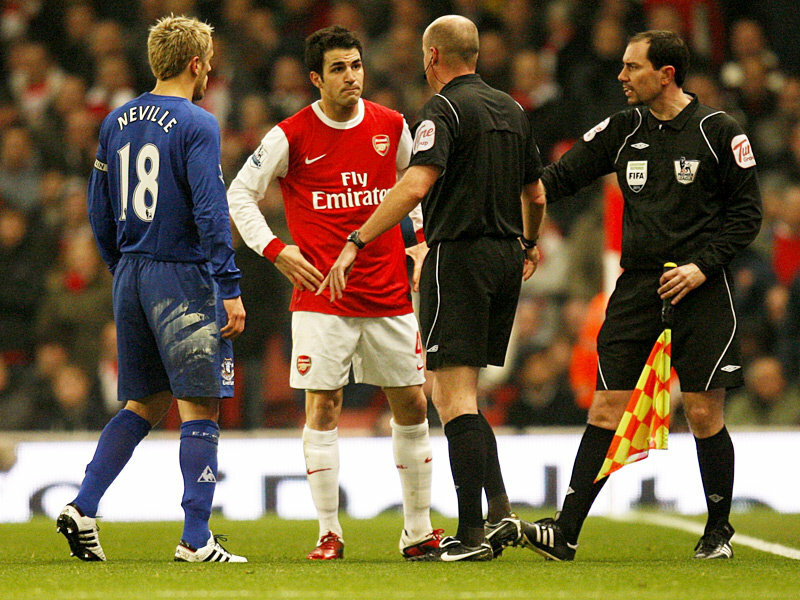 A few people have said that Cesc’s anger ‘issues’ have come from him not getting a move to Barcelona. I cannot comment on what is going through Cesc’s mind but I can comment from things I have seen with my own eyes. I see a player who just wants to win. The little stuff off camera that people only at games can see backs me up. After the Ipswich semi final, the players were out applauding the fans and Bendtner was the first to start walking towards the tunnel but Cesc shouted and called him back because he wanted a team huddle. Small things like that just show me how passionate Cesc is about this club and what a good leader and captain he is and how much he wants to win. So for me, we just have to do what we do well and continue backing our captain. The game on Tuesday night was a strange one. We started quite slow and with the debatable goal, we seemed to lose something but what ever was said at half time seemed to work and we turned the game around. A word for Andrey Arshavin too, he came on and scored a very important goal. He put in more of a shift and that was great to see. When he was about to come on, I gave my usual encouragement to any Arsenal player coming on by shouting ‘Come on Andrey’ and the lad behind me shouted ‘ **** off Andrey’ (I will let you guess what the **** mean). Once he scored, I had a smug look on my face as I turned around. Lets be honest, he hasn’t been at his best but this is where the hard work starts. As Tony Adams said, he would be telling the players that the easy part is done and the hard work starts now, so for Arshavin, if he can put some form together now till the end of the season then we are in the business and that goes for every player. Luki Fabianski has or will be going abroad to have surgery on his shoulder which will mean he will play no further part this season which for him, is a real shame. He worked hard to get into the team and cut those mistakes out and was playing rather well till he got injured. Will be interesting to see what happens in the summer but I hope he comes back strong because he did well this season. Now comes Newcastle away, always a tough place to go (and a b**** of a commute for supporters!) On a personal level, I was looking forward to going to St James Park but due to reasons out of my control (other people in other words) I could not make it, so the live screening at the Emirates will be my destination this Saturday afternoon! Winning every game is our objective so another three points is what we want and need. Come on you Arsenal (oh this season is starting to get exciting!) Every match day, I am like a kid at Christmas! Come on you Arsenal!! Ha! some people need a boot up their cakeholes ... utter rubbish. Couldn't have said it better meself mate ... we just have to do what we do best and continue backing our captain. Cheers! great post again Akhil, your getting better at this..lol..spot on with every point. If cesc was angry with team mates, throwing a tantrum with the magaer/staff then we can assume he is not happy due to barca but he is only upset when the team is below par like any captain should be. I re watched the game just to watch cesc and I honestly did not see him shouting at the ref throught the game as reported, he had a word(strong) when the goal was not ruled out, then had a convo before 2nd half kick off, was hsaking head, next was when he got tackled and then it was when Rodwell went with studs to tackle jack so it is quite normal for any captain to speak to the ref in such instances anyway. His just being in a captain! Fantastic piece of writing. Well said and can't agree with you anymore. glad you enjoyed and read it!